Mozart - Really Easy Piano composed by Wolfgang Amadeus Mozart (1756-1791). For Piano/Keyboard. Music Sales America. Softcover. 48 pages. Music Sales #AM1000648. Published by Music Sales (HL.14041278).ISBN 1849385564. 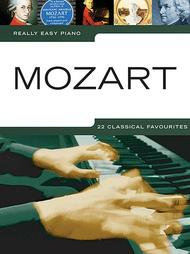 9x12 inches.Easy piano arrangements of 22 classical favorites by Mozart. Complete with song background notes and playing hints and tips.